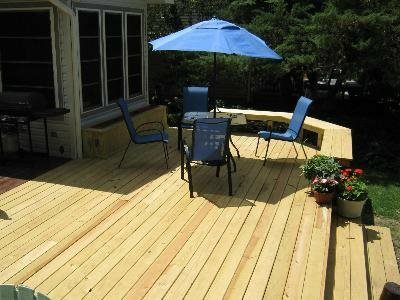 Pressure-treated wood is a nice option for low-budget decks, but does need periodic sanding and re-staining. Ipe is the most well-known type of tropical hardwood, popular for its rich brown color and durability. Tigerwood is an alternative type of tropical hardwood that has variation and streaking for a different look than ipe. Cumaru is similar to ipe, but carries a lower price tag because it’s less well-known. The options in wood range from inexpensive pressure-treated lumber all the way up to premium tropical hardwoods such as ipe, and the construction techniques, maintenance and initial expense vary widely between each material. Here, decking professionals give their tips on choosing the right type of wood for your project. The options for pressure-treated wood vary from region to region, and the quality varies as well. “We use a premium grade pressure-treated southern yellow pine,” says Baron Biedenweg of Archadeck of Fort Wayne in Ft. Wayne, IN. “Splitting and warping is rare, and there are very few knots,” he says. 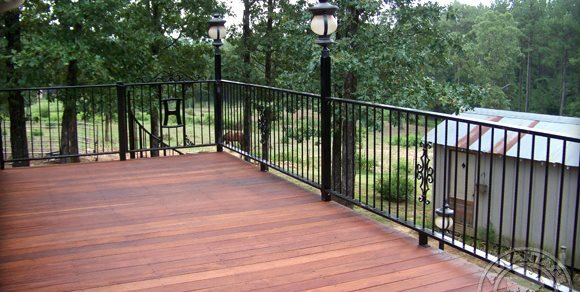 Bobby Parks of Peachtree Decks & Porches in Alpharetta, GA uses a pressure-treated product that is kiln-dried after treatment (KDAT). This reduces swelling and shrinkage and makes for a more consistent product. 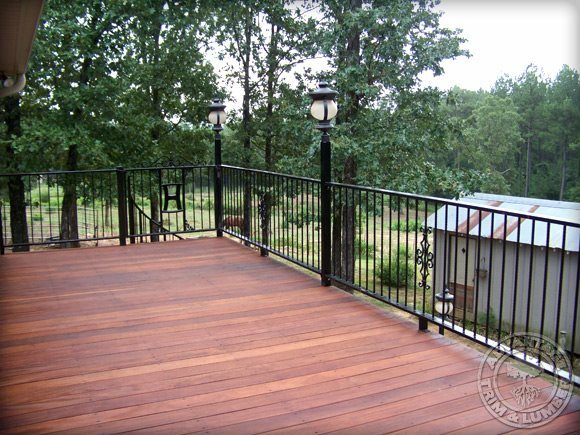 Pressure-treated wood is the least costly wood you can use for building a deck. 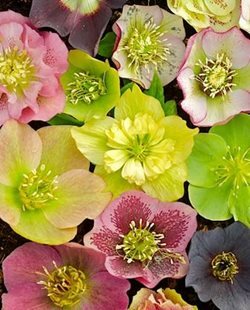 However, it is also one of the most high-maintenance materials. To care for a pressure-treated deck, Biedenweg suggests cleaning, lightly sanding, and staining or sealing the deck every one to two years. A pressure-treated deck will last 10 to 15 years if treated well. Cedar and redwood are midrange options that last a little longer than pressure-treated wood. Some people prefer the darker color and more consistent character of cedar or redwood over pressure-treated wood. Both woods are more costly than pressure-treated, yet still require the same maintenance. For that reason, “cedar’s not so popular anymore,” says Biedenweg. 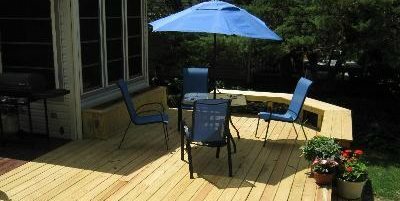 Most of Biedenweg’s clients go with an inexpensive pressure-treated deck, or spring for composite or ipe. 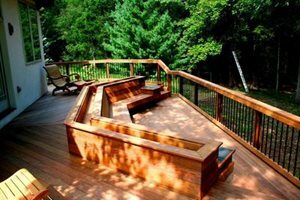 Ipe is the most expensive option available for decks, costing more than composite and other types of wood. “It’s exotic-looking, has a rich warm color and a unique grain,” says Dan Ivancic of Advantage Trim & Lumber Co. in Buffalo, NY. 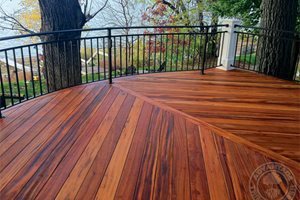 “You can tell you’re looking at a high-end deck.” Besides good looks, the main advantage of ipe decking is that it can last 30 to 50 years. 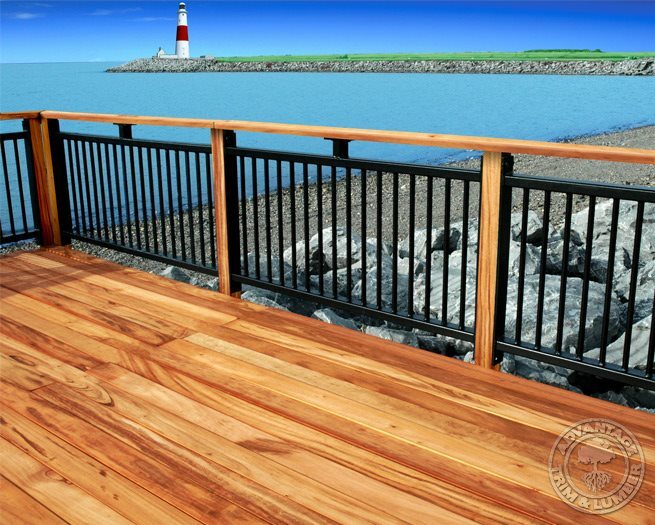 The Atlantic City Boardwalk and many docks in Florida use ipe as a long-lasting material. 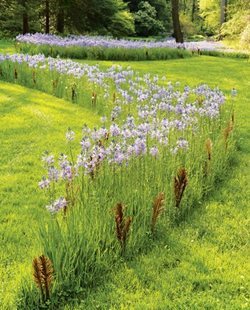 It’s not only resistant to coastal conditions, but also tolerates ice and snow with ease. The disadvantage to using ipe is that in order to keep the rich brown color, you’ll need to oil the wood every one to two years with UV-inhibiting oil. “I use a paint roller with an extendable handle,” says Ivancic. “The oil soaks in, and doesn’t sit on top of the wood.” He just removes any excess with a rag. Of course, if you like the gray color of weathered ipe, no maintenance is required at all. The oiling isn’t necessary for longevity, only to preserve the color. Ipe is more difficult to install than composites and softer types of wood. You’ll need to have your wood pre-drilled, use carbide-tipped saw blades to cut it, and select stainless steel screws and fasteners, as cheaper metals can oxidize and stain tropical hardwoods. The sheer weight of the wood also increases the time it takes to install. That said, once you have an ipe deck, you won’t have to think much about repair or replacement as it’s resistant to scratches, rot and warping. While ipe is the most well-known tropical hardwood, it’s not the only game in town. Other varieties of tropical hardwood can get you the same results with a lower price tag, because they are less well-known and therefore have less demand. is similar to ipe in that it’s a long-lasting choice with a rich color, slightly more reddish than the deep brown of oiled ipe. has a reddish-orange color with black streaking just like a tiger’s stripes, and while it’s not as hard of a wood as ipe and cumaru, it can last over 25 years. is a golden yellow color and will last 25 years or more. has the deep red color you’d expect from a Brazilian redwood, and will last 20 years on up. If you have a low budget, you will probably end up using an inexpensive option such as pressure-treated wood. However, if there’s enough room in the budget to select the material of your choice, you may find yourself struggling to decide between capped composite or a tropical hardwood. Here are some issues to consider when comparing these products. - Ipe deck boards are a little more expensive than capped composite boards. However, if you go with an alternative tropical hardwood such as cumaru, you may find the materials costs are similar. - Tropical hardwoods take more time and effort to install because the materials are heavier and require special tools to cut and drill. In addition, a small percentage of the population will have an allergic reaction to the sawdust when cutting the deck boards (this isn’t an issue on an installed deck). 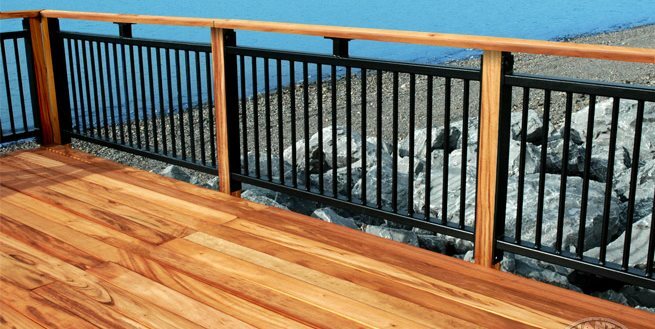 Composite, on the other hand, is a lightweight material that is easy to work with, and the manufacturing companies have an array of accessories such as hidden fasteners, deck lights, and railing options that go with the decking material itself. - While a weathered gray ipe requires no ongoing maintenance to look good and perform well, most people prefer the color of an oiled tropical hardwood, and this takes yearly maintenance. Capped composite requires no maintenance beyond occasionally washing the deck. - Ipe can last 30 to 50 years, while alternate tropical hardwoods can last 20 to 50 years. Most capped composite products are warrantied against fading and other issues for 25 years. However, some of the products are new enough that it’s hard to say how their long-term performance compares with a tropical hardwood. - Contractors unanimously said that there was no difference in what they could do design-wise with wood as opposed to composite. 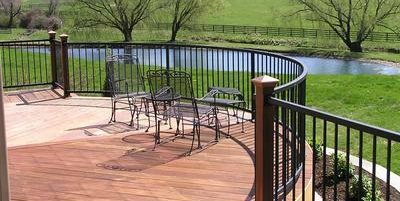 If you would like curves, octagonal bump-outs, or diagonal deck slats, all of those design features can be attained using either material. - Many people fall in love with the shimmery color of an oiled ipe, or the gray industrial look of weathered ipe. 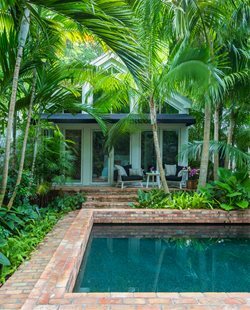 However, there are many styles of capped composite that look like a tropical hardwood. Some contractors note that in the sunshine, the capped composite has a shine that looks plasticky. Others prefer the look of composite, especially given the maintenance requirements to keep up the rich brown color of ipe. “With composite, I can go back in three years and it looks almost identical,” says Parks. With wood, a lot depends on the maintenance. - All ipe wood is harvested under the guidance of Brazilian authorities, but if you’d like that extra peace of mind, you can purchase Forest Stewardship Council (FSC) certified wood. It costs a little more to buy wood that’s certified as sustainably-harvested, but is a great choice for LEED and other projects where sustainability is key. Composite can also be a good choice for LEED-approved new construction since it contains recycled materials. For example, TimberTech decking contains 12% post-consumer recycled plastic as well as recycled sawdust from the woodworking industry in the core of each board. 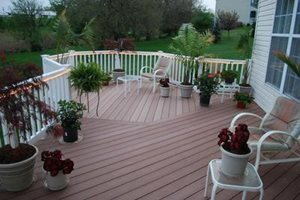 However, there aren’t currently any good ways of recycling composite decking once it’s outlived its purpose as a deck.